Produced by Yocha Dehe Vineyards, Séka Hills estate grown wines reflect the unique qualities of the Capay Valley. Selections include single-varietal Syrah, Tannat, and Viognier, as well as the proprietary red blend, Tuluk’a, which means red in the Tribe’s native Patwin language. The brand, Séka Hills, is named for the blue hills that overlook tribal lands. 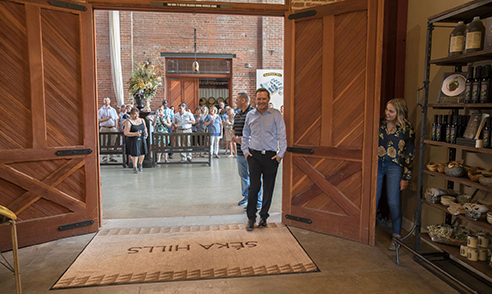 In addition to the Tribe’s wines, the Séka Hills Tasting Room in the Old Sugar Mill and the Séka Hills Olive Mill and Tasting Room in Brooks also offer tastings of the four estate Séka Hills 2016 extra virgin olive oils (Arbequina, Picual, Frantoio and Taggiasca), Séka Hills Wildflower Honey, and three richly fruit-flavored balsamic vinegars produced for Séka Hills using balsamic vinegar imported from Italy. Additional products incorporating estate grown ingredients and exclusive to Séka Hills, including flavored nuts, beef jerky, and hummus, are available for purchase. At the Old Sugar Mill, the wine tasting fee of $10.00 will be waived with any purchase of Séka Hills wines. The Séka Hills Tasting Room at the Old Sugar Mill, located at 35265 Willow Ave., Suite 205, Clarksburg, will be open Wednesday – Sunday from 11am – 5pm.